Mai Gray, the first African-American woman to be president of United Methodist Women, was deeply dedicated both to the Methodist tradition and to fighting segregation. Born in Jackson, Tennessee, in 1922, Gray worked with her husband, a Methodist pastor, to build a coalition of leadership in the Central Jurisdiction, the racially segregated administrative division that existed from 1939 until The United Methodist Church was formed in 1968. Shortly after the Church was formed, in 1976, she became president of the Women’s Division, and served until 1980. One of her crowning accomplishments was the creation of the organization’s Charter for Racial Justice, which emphasized eliminating institutional racism in the church and the world. It was adopted by United Methodist Women in 1978 and by the denomination as a whole in 1980. As a teacher, Gray valued education. She graduated from Lane College, Gammon Theological Seminary, and the University of Missouri, Kansas City. 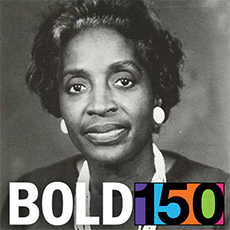 She spent 40 years as a public-school teacher and recalled the Brown v. Board of Education Supreme Court decision, which banned segregation in schools, as a “wonderful moment.” She encouraged all of her children to attend college, and they each eventually obtained advanced degrees. Gray was wholly committed to the Methodist denomination–from the segregated period of the Central Jurisdiction to the creation of The United Methodist Church and, with it, United Methodist Women. In addition to her work as president of the Women’s Division, she was involved in the World Methodist Council, served as a delegate to General Conference in both 1980 and 1984, and was a member of the Board of Directors of St. Paul School of Theology, a United Methodist seminary. Gray died in 2010, shortly after attending the United Methodist Women Assembly in St. Louis.